The EU called for calm and dialogue on Monday (18 March) as pressure builds in Belgrade and other Serbian cities against what critics describe as a slide toward autocratic rule under the leadership of Aleksandar Vučić. Thousands of anti-government protesters staged a rally outside President Vučić’s residence on Sunday to press their demands for greater media freedom and free and fair elections, a day after they briefly broke into the state television building. The break-in marked a new boldness in opposition protests that have been held weekly in the Balkan country since December. “While the right of citizens to engage in peaceful demonstrations is and remains an essential feature and core value of democracy and needs to be respected, protests should remain peaceful and within the law, as had been the case before this past weekend. Calm and restraint are essential”, Commission spokesperson Maja Kociancic said, in response to an invitation by EURACTIV to comment the developments. Kocijancic said that Parliament should be the place for debate and discussion with a view to finding joint solutions and addressing public concerns. “A structured dialogue with civil society is also essential”, she stressed. 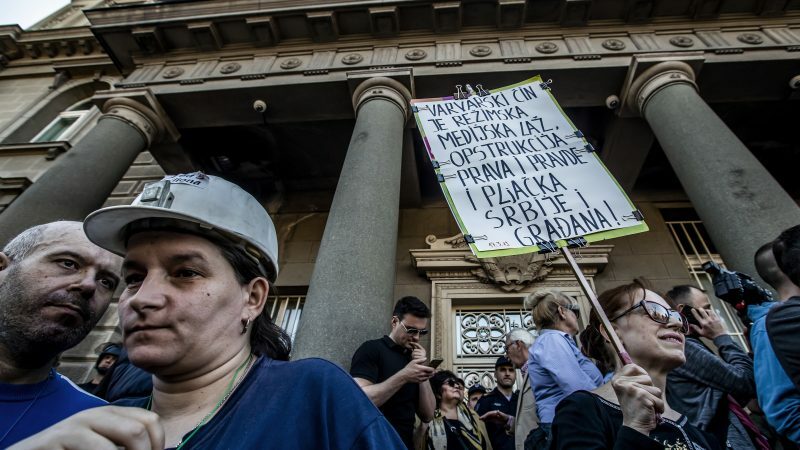 The protesters, who have been staging protest rallies every weekend for more than three months, blew whistles and shouted “resign!” as Vučić gave a news conference inside the building. “We shall continue the blockade of the presidency and we will not leave until our demands are met or unless we get firm guarantees that our demands will be met,” Borko Stefanović, an opposition activist, told reporters. The protests have spread to other cities and towns, though numbers outside Belgrade have remained small. On Saturday night dozens invaded the offices of RTS television — which the protesters accuse of pandering to the ruling party — demanding to address the population, in images aired live. The leaders of opposition parties have become more visible at the protests, and among those storming the RTS building were former Belgrade mayor Dragan Djilas and Bosko Obradović, head of the right-wing Dveri party. At Sunday’s demonstration, riot police — previously little seen at the usually peaceful rallies that began on 8 December — held back protesters scrambling to get into an area near to where Vučić was to speak, according to an AFP journalist. In his press conference at the presidential palace — broadcast live on RTS — Vučić said he was not intimidated by the protesters, whom he called “hooligans”. He also lashed out at the opposition, calling Obradović a “fascist” and Djilas an “oligarch”. Vučić, an ultra-nationalist turned pro-European, has rejected claims that he has become autocratic. Serbia, which aspires to join the EU in 2025, was criticised by the European Commission last year over press freedoms in the country, denouncing threats, intimidation and violence against journalists. Vučić has previously said he would not bow to opposition demands for electoral reform and increased media freedom “even if there were five million people in the street”, but said he was willing to test his party’s popularity in a snap vote. We`re urgently in need of k!dney donor for our sick patient and ready to pay a huge sum for the donor, if anyone or you know someone who can donate please whatzapp on ( +6 1 48 8 89 0 36 0 ) Dr. Johnny.